The decades-long Ohio & Erie Canalway Towpath Trail extension project — an undertaking that connects 100 miles of paths from New Philadelphia to Cleveland’s lakefront — is one step closer to completion with the launch of the project’s stage three. Stage three, which spans an urban stretch of 1.9 miles between the northern entrance to Steelyard Commons and Literary Avenue in Tremont, will not only serve as a greenspace buffer between the residential areas of Tremont and industrial areas of the valley below, but also offer paths and access to the rest of the Towpath Trail. Additionally, the $18.5 million project will add 30 acres of park space. Canalway Partners and its athletic and environmental cleanup events like the Towpath Trilogy Race, Cycle Canalway and RiverSweep, in its 28th year, have been just some of the grassroots events used to raise awareness and funds for the Towpath Trail extension. While stage three construction got underway in February, Canalway Partners, along with officials from Cuyahoga County and the city of Cleveland., will host a groundbreaking at Clark Field this Saturday morning, April 22, at 9 a.m. 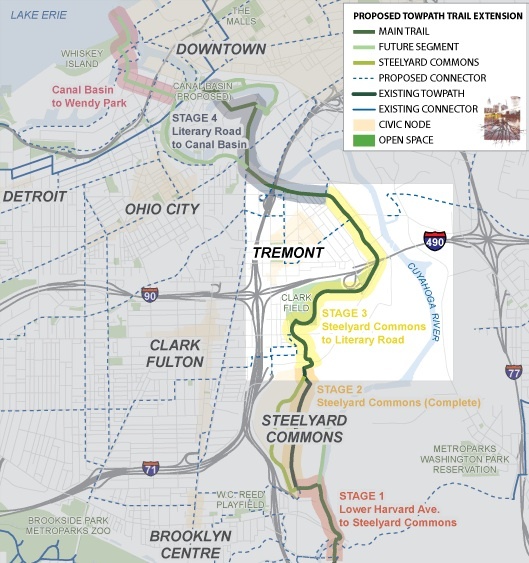 The Stage Three portion of the trail will have four connection points: at Holmden Avenue; the W. 11th connector over I-490; Tremont Pointe Apartments; and Jefferson Road. There will be three scenic overlooks at Literary Avenue with views of the downtown skyline; CMHA property off of W. 7th Street that offers views of the steelyard and railyards; and the bridge at the top of W. 11th Street and Clark Avenue with “tremendous views of the industrial valley,” says Donovan. A new driveway and parking lot will connect to Clark Field from Clark Avenue. The two current entrances to the park will be blocked off and serve as connector trails. Other plans include a new picnic area and interpretive wayside exhibits depicting the neighborhood’s industrial history along the lighted trails. The 1.9 miles also includes three wetlands and new bioswales. Funding for the anticipated project came from more than 10 sources, but Canalway Partners is credited with being the main fundraiser and is also responsible for the strategic plan. The trail is owned by the city, while Cuyahoga County is managing the project and the Cleveland Metroparks oversees the day-to-day maintenance and security. While this phase of the project is expected to take more than a year to complete. Donovan expects it to wrap up in fall of 2018. He says this phase marks a critical move forward in the completion of the Towpath Trail. The groundbreaking celebration beings at 9 a.m. on Saturday at Clark Field, located off of W. 7th Street. Volunteers are invited to bring their own shovels. Reservations aren’t necessary, but you can email Ken Schneider at Canalway Partners to let him know you plan to dig in. Donovan says the fact that the groundbreaking occurs on Earth Day is an appropriate coincidence. He adds that he is working with Earth Day Coalition officials to give some groundbreaking attendees discount coupons to EarthFest, which will also be this Saturday, starting at 10 a.m. at the Cuyahoga County Fairgrounds. The Cleveland Metroparks is part of Fresh Water's underwriting support network.